Pat Cohen “found” fly fishing in 2008. 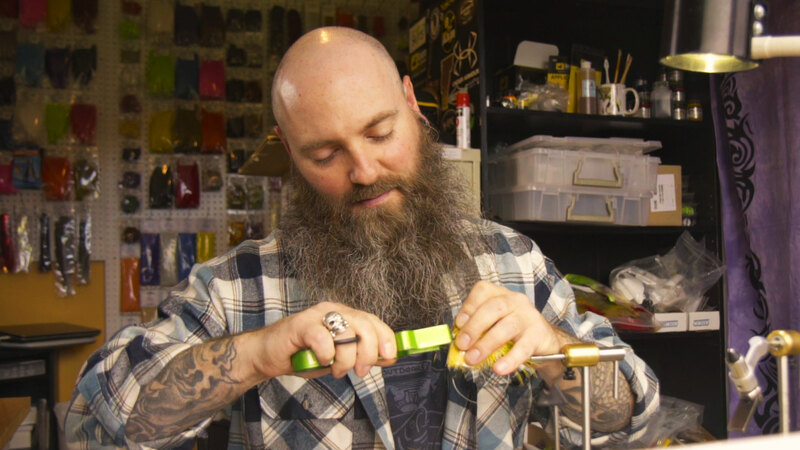 He fell in love with fly tying in 2009 and since 2012 has been a full time commercial tier, fly, material and tool designer. He runs an internet based business called Super Fly, www.rusuperfly.com. Pat is a warm water fanatic, specializing in smallmouth, largemouth, pike and carp on the fly. Pat travels all over the country teaching fly tying classes and doing presentations on warm water fly fishing techniques. Put this date on your calendar. September the 10th at 8am. At the Texas Council Expo, we again will have an incredible women’s breakfast, that this year will be highlighted by two amazing women in the sport of fly fishing!!! The breakfast will be a catered event, and a must attend event. There will be presentations from these two special guests that you will not want to miss. Come and meet some new friends, and catch up on the latest activities that fly fishing has to offer. Here is some information about our two special guests that will be hosting the women’s breakfast. They will also be seen giving presentations on both Friday and Saturday, or may be seen down at the park helping with the first class casting programs. Check the expo schedule for times on all events. Make your plans now to attend. Slots are filling up as we speak. Always the best outing of the year. The annual Oktoberfisch. Bigger and better this year!!!!! Three months and closing! Have you made your plans to attend! A great new site and great activities: Classes, Vendors, Auctions, Food, Fishing! The RV sites are filling up fast, so call now for your reservation at South Llano RV Park in Junction (325) 446-3388. Texas Council Expo goers, please join us Friday Night September the 9th as we have a great night with some Hard Eight Texas style BBQ, and Kelly Galloup, Mr. Streamer talk to us about fishing BIG streamers for trout, or all BIG Fish predators!! Kelly Galloup Kelly started his fly fishing career at the age of 13, tying flies for the local tackle shop. He started guiding at the age of 16 and still manages to run a couple trips a year. Kelly owned and operated The Troutsman fly shop and guide service in Northern Michigan for 20 years. He sold the Troutsman in 2001, and purchased The Slide Inn lodge on the banks of the Madison River in southwest Montana. Kelly has written two books: Modern Streamers for Trophy Trout and Cripples and Spinners, and has numerous DVD’s on tying and fishing. In 2003 Kelly received the living legend award from the FFF, and was awarded the Charles E Brooks memorial life award in 2007. He has over fifty nationally recognized fly patterns that are sold worldwide, and is currently a signature tier for Montana Fly Company. He is also a rod and line designer for St Croix rods and Airflo fly lines. Kelly has been published in every major fly fishing periodical in the U.S., and is one of the Editors at large for Fly Fisherman magazine. Kelly is also the host of Fly Fish TV with Kelly Galloup . As one of the most sought after speakers in the country, Kelly spends much of his winter months speaking for clubs and Sports shows across the country. Register NOW for the dinner and time with Kelly Galloup. Simply go to http://txflyfishexpo.com/# and sign up. This dinner will fill up fast so don’t wait to the last minute. Great Texas BBQ under the stars with refreshments and Kelly Galloup!! !